If you’ve got a question, check out the list below, or contact us online anytime or by calling 1.800.333.7122. Click on any question below to see its answer. Q. What organizations and professional affiliations is Wines, Steins, and Cocktails a member, and what kind of credentials does its founders, representatives, and instructors have? A. Wines, Steins and Cocktails, Ltd was founded by Dan Clougherty, Master Mixologist, Sommelier, and Hospitality Consultant. Dan is a graduate of 4 Professional Bartender Schools, 3 Wine Institutions, and has a Master’s of Business Administration. With over 40 years of practical experience and an owner of 3 businesses, he and his staff have assembled an array of fun and informative training programs, seminars, and workshops that are designed with you, the participant in mind. And that is: Staying current, up-beat, doing more of what works, emulating success, and providing you with the tools, skills, and mind-sets that will get you where you want to go faster, more competently, and with confidence. Private, Group, and Accelerated Bartender, Wine, and Hospitality Training Seminars are available on demand by design, to accommodate even the busiest of life schedules, business transitions and transformation. All training credentials and certifications are good in and out of state for a lifetime and meet all ABHF & Professional Bartender Standards to tend bar in all 50 states. Employment and Job Placement Assistance, along with references of former graduates & owners of Food & Beverage Operations, are available upon request. For an immediate list of graduates and recommendations in your area, please visit our Testimonial page! Click on to Job Placement on the Menu Bar of the website to see the the generous list of job and employment opportunities available to you and all graduates of any of the Bartender and Hospitality Training Programs offered by Wines, Steins and Cocktails for over 30 years, including your lifetime eligibility. Don’t Wait, here’s your opportunity to step into a fun and rewarding, lifetime money-making career opportunity — Start Your Bartender or Hospitality Training Certification Today! If you have additional questions, please call us at 1-800-333-7122 or Contact Us online any time. We are looking forward to hearing from you! Q. What distinguishes your Professional Bartender and Hospitality Training Programs from others; and list all the ways I would benefit by taking my training with Wines, Steins and Cocktails? A. In a nutshell, the total focus is on you from the onset. We want to assist you in every way possible to learn and develop a unique set of Mixology skills and Hospitality Training know-how, so you can provide employers more immediate reasons to hire you. As a graduate of our Bartender Programs, you, can be assured that you are an ideal job candidate. You will be prepared to be both confident and competent on the interview and on the job. We say this with great confidence, having trained Professional Bartenders working coast-to-coast and around the world for over 30 years. And more specifically, all of your instructors are Spirits and Hospitality Training professionals with years of experience – that includes formal and advanced Hospitality Training in the Professional Bartender, Wine & Spirits Trades; Food & Beverage Management, Career, and Job counseling and development. In addition, all of your instructors have owned businesses, consult to nightclub, hotel, restaurant, catering, and casino establishments, They know the business, they’ve done the hiring, and they want you to succeed. And, of equal importance; not only will you take part in a quality program with a national and international reputation, but you’ll most definitely save a lot of money, travel time, and fuel expense by learning your skills and acquiring actual bartender experience, preparing a wide assortment of cocktails and drink preparations entirely hands-on as you will do on the job – and, at a location that’s close to home. Q. Where can I expect to work upon completion of my Professional Bartender & Hospitality Training, and what kind of money and any other compensation can I expect to receive? Professional Bartending is indeed one of the most versatile and recession-proof trades in any economic environment and at any stage in one’s life. Most notably, it is consistently ranked the #1 part-time job in America. Full-time, Professional Bartenders average $600 – $750 per week…part-timers pull in $150 – $300 and more per shift and more. In addition to the excellent earning potential, you’re typically eligible for other benefits that include meals, tips, bonuses, and health insurance. Also, many Professional Bartenders run their own Bartender Event Service that can bring in $300 – $500 and more in extra income by providing Professional Bartender services for weddings, birthdays, reunions, bar mitzvahs, anniversaries, social, and political functions of all kinds. Ironically, most of our graduates make enough money in just a few shifts working on the job to pay for their entire Professional Bartender Training – a 100% return on their investment in a life-time, money-making, career opportunity. Q. 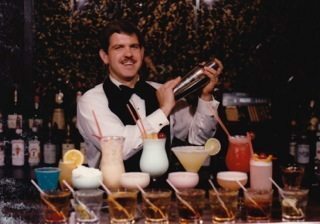 What's the advantage to getting certified as a Professional Bartender, Professional TIPS Bartender Mixologist and will Wines, Steins and Cocktails Hospitality Training help me get a job upon completion of my program? A. The answer is yes to both parts of your question. Click on to Job Placement on the Menu Bar of the website to see the the generous list of job and employment opportunities available to you and all graduates of any of the Bartender and Hospitality Training Programs offered by Wines, Steins and Cocktails for over 30 years, including your lifetime eligibility. Otherwise, read on for valuable info that should be of interest to you. People and organizations that operate businesses which dispense alcoholic beverages pay a tremendous amount of money for insurance, are required to follow a strict set of legal guidelines, and must adhere to professional standards when serving alcohol in both public and private settings. Without formal training and the guidance of Professional bartender and Hospitality Training Instruction, you’ll never be sure as to what is truly correct. Professionally trained Bartenders and Mixologists are key to the operation, maintenance, promotion, and on-going functions of a successful bar, pub, nightclub, restaurant, hotel, catering resort, casino, cruise operation. Professionally trained Bartenders and Mixologists eliminate guess-work, inconsistency, poor customer service and subsequent loss of income – none of which top-shelf establishments want to assume. An establishment can save thousands of dollars per year simply by hiring licensed and certified Professional Bartenders, Mixologists, and staff that attend Hospitality Training provided by Wines, Steins and Cocktails. Insurance companies give owners of businesses and corporations generous discounts and reductions of up to 30% off their liability insurance, simply by hiring TIPS Certified Professional Bartenders, avoiding off the street beer-tenders who have little or no formal professional skills or training; typically have questionable credentials and lack the demeanor and attitude needed to adhere to the standards required to run upscale businesses that serve a volume of alcoholic beverages and upscale cocktails and spirits of all kinds. Today’s mantra among professionals in the Hospitality Trades and the Food & Beverage Industry: Eliminate the guess-work and hire only those job candidates who can confidently, competently, and consistently perform on the job. Q. What kind of folks pursue Professional Bartender and Hospitality Training? A. Having trained and certified over 33,000 graduates since 1987 who work nationwide and around the world, we at Wines, Steins and Cocktails can offer an honest analysis, now having had the pleasure to work with so many ladies and gentlemen over the years. In general, the Bartender Trade is fairly equally distributed among men and women of all ages, with the ladies edging out the men slightly at about 6 out of every 10 bartenders. Age-wise, it runs the full spectrum 18-78, because people are motivated to pursue the Professional Bartender and Hospitality Trades at different stages in their lives, and for a wide assortment of reasons, namely: (1) They’re tired of working dead-end jobs, (2) for minimal wages, (3) unreasonable hours, (4) for thankless bosses, and (5) for no benefits. Ironically, being employed as a Professional Bartender provides an immediate solution to most of the previously mentioned problems that people experience today. (1) College students and “In-Betweeners” find that the Bartender and Hospitality Trades is an ideal way to help finance their education, pay for their automobile and insurances, and whatever living expenses necessary to enjoy both the satisfaction and the freedom to live on their own. (2) Professional Bartending is the cure-all for being able to work on your own time and your own terms; to set your own schedule; to work a day here or there at several establishments. There’s always work for a Mixology Professional in every community; part or full-time, day or evening hours. (3) If you’re a time-starved Single or a motivated “Moonlighter”, people find a job as a Professional Bartender to be most adaptable to a busy schedule as well as being a terrific source of income. (4) And those bored retirees that would like to add some spark, or those on a fixed income that would like to give their current cash situation a real boost; at $150-$300 per shift potential, along with perks like meals, bonuses, and working with your kind of crowd; well the stimulating atmosphere of the cocktail lounge provides quite a lift. As we say and our graduates agree, “Some Jobs Really Are Just Better”. Q. How do I sign up for the Professional Bartender Program, and do you have any payment plans or options? A. If you, your friends, food & beverage staff, or hospitality personnel would like to take part or get involved in any of our Professional Bartender School and Hospitality Training Programs being held in your immediate area, you have several easy ways to register – all of which offer you the unique opportunity to make your payments on any of our easy pay-as-you-go plans, the most generous in the the Hospitality Training Industry. We look forward to assisting you in achieving your goal to become a Professional Bartender, TIPS Certified Bartender Mixologist, or a Showcase Flair-Bartender Pro: all life-time, money-making career opportunities working on your own time and your own terms. If you have any questions about any of our forthcoming programs that will be held in your immediate area, please give us a call nationally at 1-800-333-7122 or forward us an email with your thoughts! It will be our pleasure to fill you in on the details. We look forward to hearing from you! Don’t Wait, Start Your Bartending or Hospitality Certification Today! If you’ve got questions not answered by our FAQs, call us at 1-800-333-7122 or Contact Us online any time. We can’t wait to hear from you!